Click here if you need details to plan your trip to Italys Cinque Terra or Santa Margherita/Portofino. Getting There: The Cinque Terre region is approximately 150 miles south of Milan and 250 miles north of Rome. Depending on the U.S. departure city, flights are available to both cities on Alitalia, British Airways, Delta, KLM, Lufthansa, SAS, and TWA. Milan is also served by American, Continental, Swiss Air and United Airlines. Milan has two airports accessed through U.S. flights (MPX and LIN). The 1-800 phone numbers and Web links for these airlines are available at this magazines Airline page. Train travel to the Cinque Terre region is recommended for its convenience. It is an arduous voyage by car, with no available parking in most of the villages. Similarly, the 50 mile trip north from the Cinque Terre to Santa Margherita/Portofino is easy and inexpensive via train. If you are traveling elsewhere in Italy and/or Europe by train, you may want to consider a Eurail pass or an Italy-only regional train pass. These are availabe from Europe Through the Back Door, Inc., (206) 771-8303 and Europe by Eurail. Staying There: Although the Cinque Terre region is still relatively unkown in relation to other sections of the Italian Riviera, it is popular with Italians. This fact, coupled with the small size of the villages, means that it is a good idea to have reservations at lodging establishments in the summer. Avoid weekends in August. Our stay at Pension Sorissos, the only hotel in Vernazza, was very pleasant with good meals. The hotel is close (but not too close) to the train stop and only a few hundred feet from the harbor (Phone: 812224). Sorissos is a full-pension hotel, requiring that you have breakfast and dinner there. But the food is good and the price is reasonable. 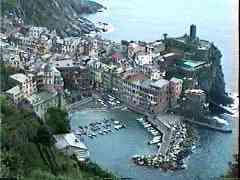 A variety of lodging accommodations and eating establishments for the five Cinque Terre villages are described in detail in Rick Steves' Italy. This and other good references for Italian travel, such as Fodor's Italy, are also available via the amazon.com link below. Accommodations in Portofino are limited to expensive three and four-star hotels in the hills above the harbor. There is a greater variety of lodging in Santa Margherita, and the access to Portofino during the day is convenient. Additionally, Santa Margartita has a much broader base of restaurants. Rick Steves Italy also suggests lodging in Santa Margherita. Italys Cinque Terre region consists of five beautiful coastline villages along a 10-mile stretch just north of La Spezia. The main occupations of the villagers revolve around their vineyards and fishing, The population of each town is less than 1,000, except for Monterossa with 2,000 inhabitants. The train provides access between the villages at approximately 2 hour intervals. Hiking trails also connect the villages. Auto routes are very arduous. Santa Margherita and Portofino are located approximately 60 miles north along the coast from Monterossa. The two towns are famed resort destinations. Portofino is one of Italys most-photographed Mediterranean harbors. FAQ on Cinque Terre: another perspective and additional information on the region.